28. » Joannes Engel, Trevirensis ex Susberg, jur. cand., gratis. 1. Dec. Petrus Josephus Gülch, Julias, jurium cand. rite inchoati et per duos annos non interrumptim usque ad diem 6.
sitatis munitas et rectoris academici manu subscriptas accepit. Franciscus Philippus Haas, Wormatiensis, sem. conv. Ignatius Volmar, Mannheimensis, sem. conv. Joannes Jodocus Hoffmann, Mogonus, sem. conv. Hermann. Wernerus Baader, Widtacensis, sem. conv. Henricus Vogel, Mannheimensis } logici. Daniel Huber, Mannheimensis, sem. conv. 4 s. unten S. 163 A. 4. ^er. ser. 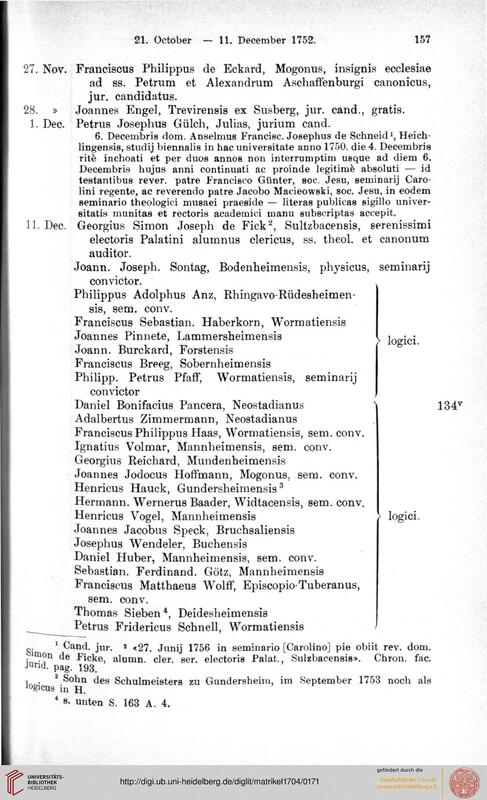 electoris Palat., Sulsbacensis». Chron. fac.